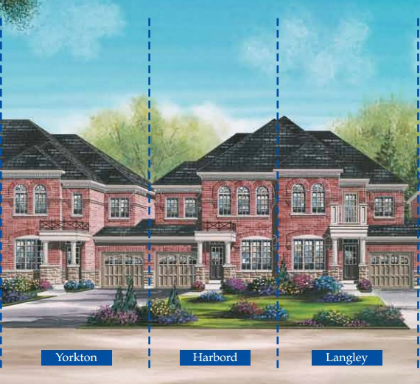 Only 8 Townhomes Remaining at Upper Unionville in Markham! After the successful and very busy opening of the final phase at Upper Unionville in Markham, Fieldgate is happy to announce that there are only eight 25’ townhome lots remaining! The available townhomes range from 1,775 to 1,986 square feet. These last eight townhomes are available in three different models: Harbord, Langley, and Yorkton. Each one features three bedrooms and 2.5 bathrooms. We also have a special bonus promotion on the final homes of Upper Unionville. If you purchase a townhome, you will receive $3,000 in free decor upgrades and three stainless steel kitchen appliances (fridge, stove, dishwasher). Other high quality appointments include natural oak stairs, 9’ main floor ceilings, brushed nickel interior door hardware, upgraded 4 1/4” Aristocrat baseboard, and cold cellars (as per plan). The master ensuites feature luxurious oval tubs and separate showers and the master bedrooms have soaring 9’ tray ceilings. The Upper Unionville sales office is located at Kennedy and 16th Avenue in Markham. Pay us a visit Mon-Thur from 1pm – 8pm or on the weekend from 11am – 6pm. You can also call 905-477-6464 for more information. Don’t miss this chance to call Markham’s most prized community home!